This month culture360 contributor David Fernandez travels to George Town, Penang, the historic city of the Straits of Malacca in Malaysia. In this article he describes the current panorama of contemporary arts & cultural heritage, focusing mainly on the creative platforms that are aiming to become the catalysts for city change. With over 200 years’ history as a global and regional trading hub, modern-day George Town is one of Malaysia's largest cities with 600,000 inhabitants. George Town, Penang’s bustling cultural capital, nowadays is certainly one of the most exciting cities in Malaysia. From its beginnings as the first British Straits Settlement in the late 18th century, Malaysia’s oldest city went through major transformations over the last two centuries, from a swampy frontier, to an active trading post, to the present city of living history, urban heritage and contemporary arts and culture. Listed as a World Heritage Site by UNESCO on July 7 2008, George Town is a excellent sample of well-preserved cultural and historical heritage, presenting a rich and mixed collection of historic buildings in various styles, an architectural legacy that represents the multiple ethnicities that have settled and inhabited in the city for the past two centuries. A truly testament to the diverse vitality of the island. With this vibrant multicultural landscape as an ideal backdrop, discussions with several active players in the creative and cultural industry yield a consensus that Penang is currently experiencing a rebirth in arts and culture. However, further investigation reveals that despite the positive vibrations felt throughout the industry, there remains a disconnected ecosystem. The listing of George Town in the UNESCO World Heritage Site list served as the catalyst for the main platform for the arts which very possibly is Malaysia’s most successful arts festival: George Town Festival (GTF). A month- long festival inaugurated in 2010 that started as a series of arts and culture events in celebration of the city’s listing as a UNESCO Heritage Site. The festival showcases the unique diversity of George Town’s art and heritage in the context of its World Heritage site environment and serves as a catalyst to encourage cultural exchanges. From world-class performances to cross-cultural creative collaborations, experimental art, traditional and contemporary performing arts, as well as exciting local community initiatives run and public installations presented by different artistic communities - amateur groups, cultural groups and professional performers -, each year the always refreshing multidisciplinary programme fills this city-wide stage with renowned performances and exhibitions, serving also as a platform for local acts to showcase their ever-evolving creative development. Highlights from this year’s edition included Titanium, a contemporary dance performance from Spain that fused elements of flamenco, hip hop and breakdance; Robot Theatre, an adaptation of Franz Kafka’s Metamorphosis by Japan’s Seinandan Theatre Company; and Broken Nails: A Marlene Dietrich Dialogue, a one-woman play by Polish puppet artist Anna Skubik. Besides, on the local front, audiences experienced 100% Penang, an interactive performance by 100 Penangites as well as ATM (‘All Things Malaysian’), a celebration spanning the island’s breadth of traditional and contemporary arts, culture, food, film and performances. In addition to other embedded festivals such as Obscura Festival, the country’s first international annual photography festival, and the Digital Art + Culture (DA+C) Festival, an innovative culture and heritage-inspired digital festival that showcases groundbreaking talents from animation, video, design, computer programmers and music, this year, the George Town festival brought over to mainland Malaysia for the first time the Butterworth Fringe Festival, with an exciting line up, featuring pop-up bookstores, movie screenings, creative crafts, exhibitions, presentations and also live performances. The George Town festival is also highlighted as the only Malaysian good practice in the creative industries in the publication ‘Enabling Crossovers: Good Practices in the Creative Industries’ published by the Asia-Europe Foundation (ASEF) in 2014. 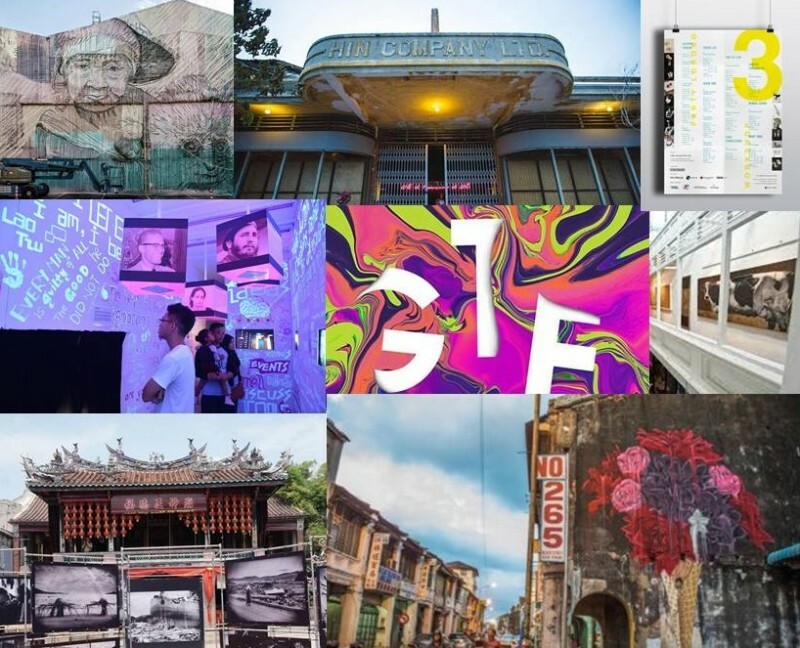 All of the previous excellent samples are proof of the many efforts that are being developed in Penang lately in order to spearhead the promotion of art, culture and creativity, as well as to protect and ensure that George Town´s unique cultural legacy. These initiatives are also linked to other local cultural projects contributing to the promotion of a sustainable and vibrant creative urban environment. Meanwhile, independent art spaces and collectives seem to keep flourishing while promoting new creative expressions, not just during the festival’s busy month of August but all year round. One example is ChinaHouse, a traditional compound of three heritage buildings, linked by an open air courtyard and converted into 14 spaces comprising live music venue, galleries, shops, café & restaurant with an active cultural programme, including exhibitions, screenings, workshops and weekly live music events. Following this emerging trend of cultural energy, another creative platform recently inaugurated yet still under construction is Hin Bus Art Depot, once an abandoned bus depot, now a multipurpose contemporary art centre with an eye in the new generations of contemporary artists in Malaysia, helping increase the exposure and appreciation of contemporary art in the local community. They also organized outdoors activities such as Urban Xchange, a community-oriented project that aims to benefit the development of Penang artistic landscape, enabling cultural, artistic and social exchange mainly through urban art. Earlier this month a public-funded project has been presented to transform Sia Boey old market complex site into the Penang Heritage Arts District by the Penang State Government, aimed at ‘capitalising on art and heritage as the economic catalyst to drive urban regeneration’. Besides plans to create a privately funded public art museum, the old shop houses will be restored and reoccupied by art galleries, studios, schools and workspaces. Aside from new art venues, also independent art-related collectives are emerging in George Town these days, such as Syiok Wasabi, an small size platform that promotes local and regional handmade crafts and artworks, as well as encourages the re-branding of traditional forms of arts and crafts. One of their flagship activities is Party Lorong, an interesting community event that provides a platform for interactive learning between artists and craftspeople through dedicated workshops. In short, another promising bottom-up example to be added to the list of a city that keeps discussing intensively about the pivotal role of creativity and the arts in urban regeneration - not to mention the risk of gentrification faced by many and other challenges derived from tourist pressure. At the same time, George Town is exploring new ideas and activities that bring communities and people together. Yet for many, still, George Town cannot be considered yet as a proper creative hub in full swing.